Hi everyone! I'm so excited and honored to welcome my dear friend , a talented Brooklyn-based illustrator and author who has so touched so many beautiful things with her work from illustrations and hand lettering for major magazines to her own beautiful books. 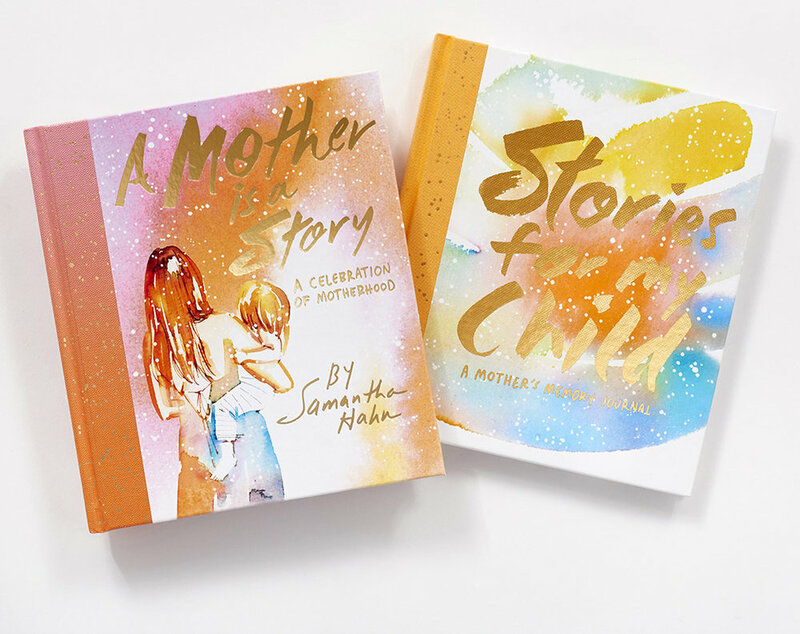 She is celebrating the launch of her two recent titles, and a Journal to match called , both published by so in honor of mother's everywhere I've asked her to visit us today and give us 10 tips for balancing work and motherhood. As a working mother of two young children (shown above with her husband and two little ones), Samantha definitely has a lot to share in this area. It's not easy to ru a successful business AND be a responsible mother. It constantly requires you to stay on the ball. There is rarely any "down" time. From early morning until late night, working parents are swimming upstream. Yet, parenting has so many rewards which is why the extra work doesn't stop women from wanting to raise families. It just requires that we each find our recipe for success. Below are her tips, please comment with some of your own so we can build out this conversation. I'm a freelancer too with an active toddler so I'd really love to see how other moms are finding their way balancing family life and their business. 2. Be flexible. Look, forget the list. Did you get them to school and back? Go, Mom. 3. Go with the flow. Children change constantly, so there’s no point settling into a routine. Write while the baby naps. You’ll get the time back when your teenager sleeps all day. 4. Kill two birds. Put your kids to work. If that toddler has so much energy, he can push a broom. 5. Embrace conflict. Resolving disagreements and learning to compromise is an important skill for life and work. Use arguments as an opportunity to show the kids how to get through them. More effective than any lecture. 6. Don’t be a phoneworm. My dear friend Linsey’s 8-year-old daughter coined this term for an essay about the bookworm’s screen-addicted mom. Sure, you may occasionally need to answer an important email during family time, but otherwise keep it in your pocket. Put the mom back in “working mom.” Show your kids how to balance a dynamic career with a family life you actually live. 7. Respect the clock. I want to be with my family 24 hours a day and work the other 24 hours. Since I can’t make the Earth rotate any more slowly, I have to give myself a break and do the best I can with the time I’ve got. Let go of the guilt. 8. Show and Tell. I’m a freelance illustrator and that means I have to hustle to survive. I don’t know about the media-ready mom entrepreneurs who gracefully float through business and life, but my work demands as much energy and passion as being a mom. Doing both pushes me to the limit, but as a result my kids get to see me get knocked down and get back up again to face another day. 9. A little self-care goes a long way. I used to jog 5 miles day. Today I’m thrilled to crack 5 a week. It’s nothing to be ashamed of—being a working mom is its own marathon. I just take a few, small, imperfect actions when I can to thank my body for the hard work. A short walk. A five-minute meditation. Even a deep breath can make a big difference when life gets ahead of me. 10. Don’t do it alone. When my son was young, I felt guilty about sending him to daycare. His pediatrician set me straight: “The more people who know and love your son, the better.” Build a community for your children. Expand their horizons by introducing them to new people and different places. You’ll always be their home. So everyone, can you add to my list? Holly and I would love to see what tips other mom's out there have to add to the list! It's always so fascinating to hear stories of how others are making things work. Seems everyone out there has a different recipe to parenting! If I could distill the feelings in my heart when I first looked at my children, each time I smelled them or felt the softness of their skin and the warmth of their bodies, I would bottle it against the days I both dread and feverishly work toward, when they need me in their hearts but are strong enough to stand apart. So on to ... 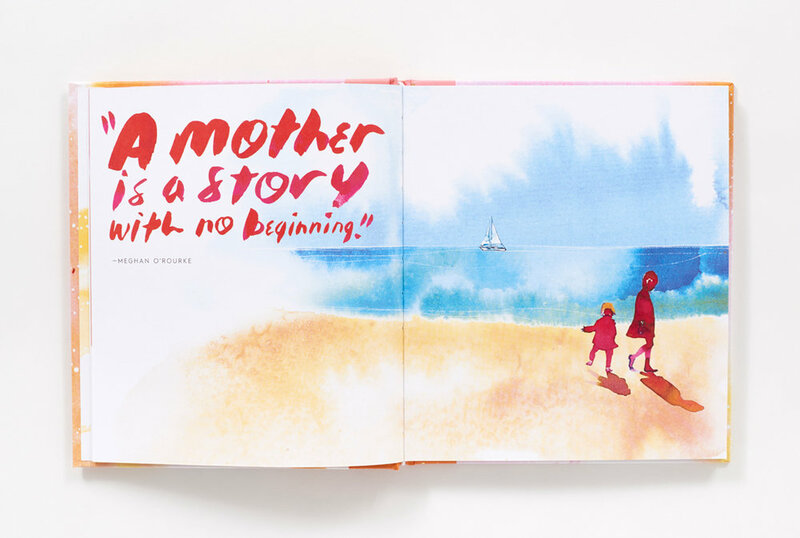 Creating this book and the journal to go with it (all shown in the photos above), I wanted to see if it were possible to portray this shared experience of motherhood in all its glorious, messy beauty. Instead, I’ve found that each idea resonates at different moments, as different aspects of this incredible journey come to pass. Nothing prepared me for motherhood’s constant whirlwind of emotions, simultaneous and conflicting. Deeply in love and deeply exhausted. Exasperated and proud, worried and blissful. These feelings make their own special harmony and become the song of motherhood. I hope these words and illustrations strike a chord with you. I hope you recognize yourself, your children, your own mother, and the love that permeates your life in these pages. Thank you for having me on your blog today, Holly!